We are a top notch supplier of Lamy Pens. Writing Fountain Pen with its smart choice of high-quality finishes, matches just about any style or mood you're in. - Body And Cap: Made Of Sturdy Matte Black Plastic, This Mechanical Pencil Is Designed For Sketching, But Writes Just As Comfortably. - Clips And Trims: It Has A Palladium Finish Clip That Is Removable. - Mechanism: It Has A Push-button Mechanism And Comes With 0.7mm Or 3.15 Mm Lead. Backed a team of hardworking professionals, we have been able to manufacture and supply an exclusive array of UNO Lamy Ball Pen in Kolkata, West Bengal, India. Designed with ultra-grade components other raw material at our well developed manufacturing unit. Our customers can avail this range from us at industry leading prices. Body and Cap: Multi-system pen with matt black lacquer finish. Mechanism: Fitted with ballpoint pen refill LAMY M 21 black and propelling pencil lead 0.5 (LAMY M 41) HB.With system identification ring and built-in eraser (LAMY Z 15) underneath the removable button. We are a top notch supplier of Lamy Pen. Our reputed entity is engaged in supplying Lamy Pen. 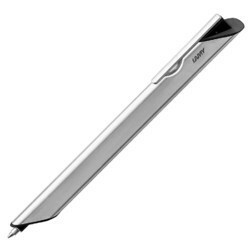 We are engaged in offering Lamy Pen.